Come celebrate with CookiesKids.com and Wee Share for their “Something TWO Celebrate Birthday Bash”! In honor of Raileigh’s second birthday, Cookie’s is hosting a giveaway for a chance to win a prize of your choice from CookiesKids.com! If you are anything like me, you like to dress your kids in cute clothing. It seems, though, that really cute clothes often costs way more than I am willing to spend! At the rate Raileigh is growing, I just can’t afford to spend a lot of money on each garment. Fortunately, I recently became acquainted with a store where buying high quality, fashionable clothing for your little one won’t break the bank. That store is Cookie’s – The Kids Department Store. 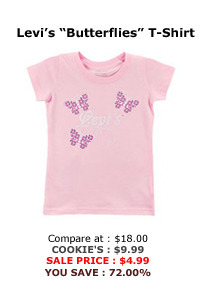 Cookie’s is a New York based store that offers amazing deals on clothing for our children. They also have an online store where you can find a plethora of amazing deals and rock bottom prices! Cookie’s first opened their doors in 1975, and has since expanded to include 7 New York City locations. Crain’s Magazine has dubbed them the “#1 School Uniform Headquarters in the United States” and “World’s Largest Kids Department Store”. Cookie’s is set up to be very shopper friendly. It’s easy to shop only the sizes you need. Plus, there are a lot of options in each size range, so you are sure to find something in your taste and your budget. I started browsing the girls 2T- 4T category. Each page has 20 garment options, and there are 21 pages of clothes. That’s over 4,000 different items just in Raileigh’s size range! VERY impressive! If that’s a bit too overwhelming for you- no worries! In just one click, you can filter the results down to the exact type of garment you are looking for- sleepwear, shoes, outerwear, and more. As I started browsing, I was continually blown away by the deals I saw. Here’s a few of my current favorites from the Cookie’s website. Can you believe those prices? Pretty incredible! Needless to say, I was incredibly excited when I was given the opportunity to work with Cookie’s on a review. I chose several items for Raileigh, and the team at Cookie’s got them out to me in record time. 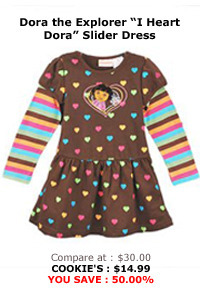 The first item we were sent for review is the Dora the Explorer “I Heart Dora” slider dress. Raileigh has recently fallen head over heels for this Spanish speaking girl. 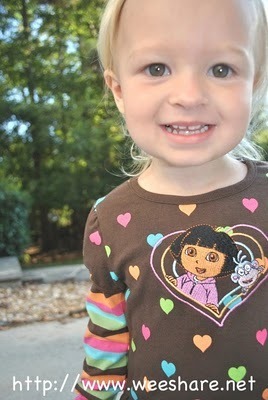 Every time she catches a glimpse of Dora, she excitedly exclaims “Dora!” along with the names of all the other characters on the hit TV show. So, I had no doubt that Raileigh was going to love this dress. I really wasn’t sure how I was going to feel about the dress, though. Some character clothing is not made very well, and the sizing runs really weird. However, the moment I saw the dress, my mind was changed. This dress looks fantastic. 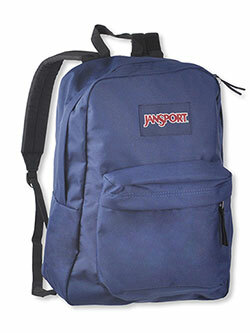 It is soft, durable, and the embroidered design looks very well done. Plus, the sizing is spot on. I was concerned that the dress might be too wide for my slender daughter, but it isn’t at all. The fit- length, width, and the arms- is just right. 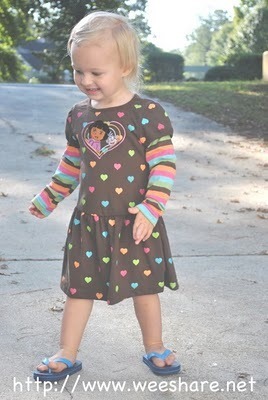 Of course, Raileigh is in love with her new dress. It’s quite comfortable, and is great for her to play in all day. The dress is bright and fun, and really matches Raileigh’s personality quite well. She has asked me to wear this dress several times since it arrived. How can I say no? However, I can’t wait for the cooler months so that the long sleeves are a bit more weather appropriate. The second item we were sent is the Owls T-Shirt by Levi’s (sorry, no longer available). You all know that I really have a thing for owls, so I was incredibly excited when I found this tee. 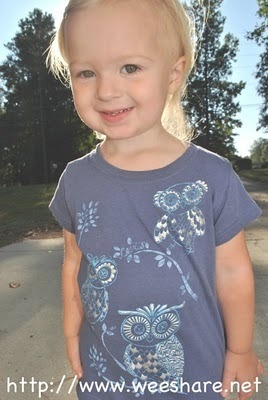 Plus, Raileigh has recently been really excited about owls as well. She will even make a hooting sound, just like an owl! I may have been excited about this shirt when I saw it online, but I saw even more thrilled once the shirt arrived. There are little spots of shiny silver on the owls wings, and I hadn’t noticed that when we originally picked the shirt out. It really adds an extra dimension to the shirt. The shirt itself is incredibly soft. Really, it’s so soft and I love the design so much that I wish they had one in my size! Raileigh is really enjoying her new shirt. It’s great to play in or to wear to preschool. I like that she can wear it now while the air is still hot, and that I can layer it with a long sleeve shirt for continued use in fall and winter. I could not be more pleased with our clothing from Cookie’s – The Kids Department Store. I just wish I lived closer to their retail locations so that I could go in and browse. However, I am quite thankful that they list their inventory online so that those of use who live far away can still take advantage of the amazing deals. 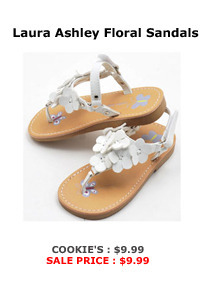 You really should head on over to the Cookie’s website and check out the deals for yourself. 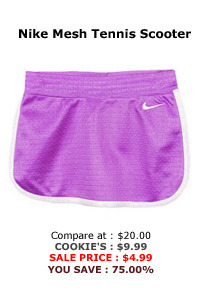 I think you will be amazed at the money you can save by shopping with Cookie’s. However, after you look around, don’t forget to come back here. That is because Cookie’s is hosting a spectacular giveaway at Wee Share! One lucky reader is going to receive an item of their choice ($40 or less) from CookiesKids.com! Head on over to Wee Share & leave a comment on which item from CookiesKids.com you’d think you might choose if you are the lucky winner! Enter soon – this giveaway closes September 27, 2010!